The Black Panther Party has always been at the forefront of fighting for the rights of African Americans. 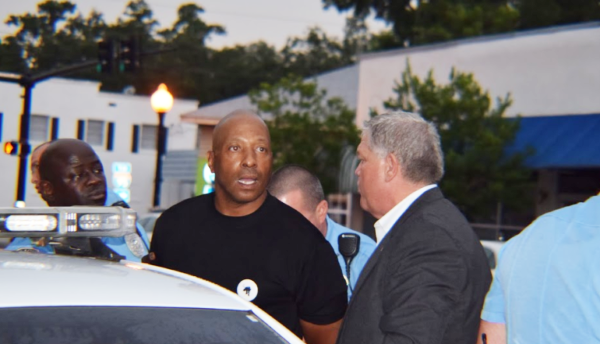 Recently, a member of the New Black Panther Party was arrested in nearby Kingsland, GA, for participating in a protest. Minister Mikhail Muhammad was arrested last week for protesting outside Kingsland City Hall. He was cited for disorderly conduct for not give up his megaphone. He protesting the murder of Tony ‘Punch’ Greene, who was killed by Kingsland police officer Zechariah Presley on June 21, 2018. Presley, who is white, was following Green, who is black, and pulled him over for a reported traffic violation. Presley made physical contact, but when Green ran, “Presley fired multiple shots resulting in the death of Green,” according to a Georgia Bureau of Investigation statement. The GBI reviewed video from Presley’s patrol car and body camera. Arrest warrants were issued for Presley, who turned himself in to the Camden Sheriffs Office. Kingsland Police Chief Daryl Griffis recommended that Presley be fired and Kingsland City Manager Lee Spell agreed. The department also released Presley’s personnel file, which shows he was hired last year despite admitting that he had physically fought with his wife, had bought or sold marijuana, repeatedly shouted at people, was involved in “2-3” accidents and had been arrested for “reckless, eluding, speeding,” according to his handwritten text. In the photo Minister Mikhail Muhammad confronts Police Chief Griffis. Muhammad was later arrested and released. New Black Panther Party will be back in Kingsland for the next City Council meeting.